In war, life has a way of turning on a dime. It is often a small choice that determines who lives and who sacrifices his or her young life. The Vietnam War was no different than any other bloody war. However, for the young guys who lived it, breathed its vigorous stench of rot and mud, the Vietnam War was like no other. In retrospect, life was simple here: turn left, you live; turn right, you die. The Boomerang, Bounty Hunter, and Green Delta aircrews of the 191st Assault Helicopter Company (AHC) had their share of both choices. 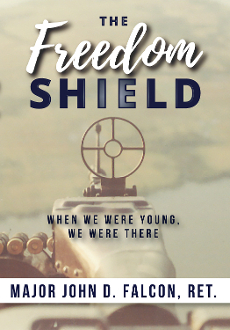 The Freedom Shield: When We Were Young, We Were There is the collective stories of the 191st AHC. A precious gem lay hidden within their underdog appearance. The unit assembled from a hodgepodge selection of hand-me-down aircraft, used equipment, and overlooked personnel who wanted to make a difference. And they did. Their collective stories define a new breed of soldier: the combat assault-helicopter crewman.